Amy’s recent post on the Holiday Auto Theatre got me motivated to do a little free movie research and I thought I’d pass along the information to our wonderful FFC viewers. I love going to the movies but my kiddos are hit or miss so that is why I LOVE it when summer rolls around and we get to see some free movies. I think they enjoy the “movie process” more than the actual movie – getting the popcorn or picking out a smuggled treat, settling into our seats and watching the previews is great fun for them. But if they start to loose interest in the movie, I don’t feel so bad if we have to bail out since it’s free. For those closer to the heart of the Queen City, you’ll have to visit Fountain Square on Saturday nights for Toyota’s Movie Night. They’ll have two movie showings. The first starts around 7pm and then they’ll have a brief intermission after the movie before they start the second movie. You’ll want to bring your own blankets and/or chairs. They’ll also have concessions on site to fulfill all your movie cravings (adult beverages even offered). The movies start June 5 and run through Aug. 28. 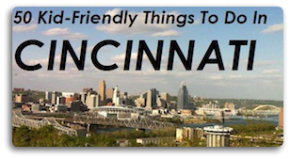 You can read more on Shannan’s recent post about Family Fun on Fountain Square and also see what fun events they have during the day. There are also local movie theaters offering free movies. Enjoy the Regal Free Family Film Festival every Tuesday & Wednesday at 10am. The first movie debuts on June 15 and the festival runs through Aug. 11. The Regal is located at 5500 Deerfield Blvd. Mason, OH 45040. You can call (513) 770-0964 for more information. Kidtoons also has movie showings. The Kidtoons shows aren’t free, but the tickets at National Amusements Springdale 18: Cinema de Lux Theatre are only $3.50 and you can also buy an adorable kids’ combo for $3.50. On June 12-13, you can see Jim Henson’s Dinosaur Train. Check back often since new Kidtoons shows will continue to be added to their listings. They also have a Bookworm Wednesdays program (starts July 7th for 6 weeks) which encourages kiddos to read. Kids will get free admission to the 1o am movie if they submit a book report. For kids ages 6 and under, no book report in required and parents and kids automatically get free admission. Bookworm Wednesdays is held at the Springdale 18 location: 12064 Springfield Pike, Springdale, OH 45246. Another movie place to highlight is the Parkland Theatre. I’ve never been to this theatre but would really like to go some day. Why? The movies are only $2 all the time. They may not have the first run movies but with all of our hectic schedules, it’s hard to always get to a first run movie. Bonus…… I just read that most concessions are only $1. What a deal. Click here to read a bit more on the Parkland Theatre’s history. They are located in Sayler Park (on the river) at 6550 Parkland Ave, Cincinnati, Ohio 45233. Call 333-5436 for their movie hotline. Many of you may have also read about www.watchthisblog.com but if you haven’t, here’s the synopsis: Some friends wanted to see all the AFI top 100 movies in one year so they started a blog and started finding movie theatre venues to host the movies. They watch two movies a week at different locations in Cincinnati and invite friends, family and strangers you to watch with them. The movies are free but on their blog they do have a donation request (no pressure) to help defray the costs of obtaining the movie rights. I’d really like to make it to one of these events too. If you know of any free movie opportunities in your community, please let FFC know so we can add to our post. Also, if anyone knows why sometimes we spell theatre with an “re” versus theater with an “er”, please let me know. Spell check is always on my case about that. I guess I could google it but after all my movie research tonight, I’m “er” kind of all done.